1 of 3 Bring 3 cups water to a boil; stir in rice. Reduce heat, cover and cook 20 minutes. 2 of 3 Meanwhile, slice beef across the grain into thin strips, each about 3 inches long. Heat 2 tablespoons oil in a large skillet over medium-high heat. 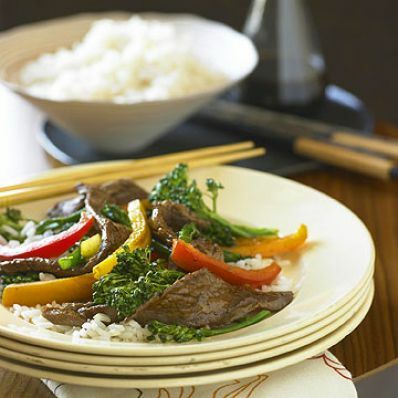 Add beef and stir-fry for 3 minutes. Remove to a platter with a slotted spoon. 3 of 3 Stir pepper strips, broccoli and 1/3 cup water into pan. Cover and cook 4 minutes. Uncover, add beef and stir-fry sauce. Cook 1 minute. Serve with rice on the side. Per Serving: 3 g fiber, 891 mg sodium, 31 mg chol., 2 g sat. fat, 63 g carb., 13 g Fat, total, 26 g pro., 470 kcal cal.